Tom has found a new hobby. Whenever he goes to a restaurant, viagra he orders an entree, and if he likes it enough, he comes home and challenges me to recreate it. He’ll say “I had Penne Puttanesca this weekend. It was good, but I bet you can make it better.” Sneaky. Very sneaky. He knows I like a challenge. So, this weekend I set out to recreate the puttanesca pasta he enjoyed so much. A quick read on wikipedia revealed tons of interesting tidbits about puttanesca — most of which had to do with the origins of the dish’s name. Apparently, no one really knows how this dish came to be named after ladies of the night (to put it nicely). Some say it’s because it’s cheap and quick to prepare, others say that brothel madams made the dish to lure customers into their “shop”, and still others say it’s for reasons too vulgar to mention on a food blog. In the end, no one knows how Puttanesca got its name. And frankly, I’m not sure I care. It’s quite tasty either way. This simple pasta is inexpensive and comes together in 20 minutes or less, which makes it the ideal candidate for a weeknight dinner (or lazy weekend dinner if you’re sick like me!). Also makes a good Lent Friday dish. Simply saute garlic and dried chiles in olive oil, add tomatoes and anchovies, simmer, then stir in some olives and capers. Toss with pasta and you’ve got a strong and spicy pasta dish that sure to entice. Set a large skillet or wok over medium-high heat. Once it’s hot, heat the oil then add the garlic and chiles. Cook for 2 minutes or until the garlic just begins to brown, then add the anchovies and tomatoes and reduce to medium-low, stirring often. When the anchovies have dissolved into the sauce, stir in the olives and capers and turn the heat to low. While the sauce simmers, make the pasta. Set a large pot of water to boil. Normally, I advise salting the water heavily, but since this sauce is chock-full of briny capers, anchovies and olives, I’d skip the pasta water salt. When it comes to a rapid boil, add the pasta and cook until almost al dente, but still not done. Using tongs, transfer the pasta directly from the cooking water into the skillet with the sauce, tossing with the sauce as you go. You may need to use a slotted spoon to get all the pasta out. Toss in the skillet for a couple of minutes to finish cooking the pasta, then serve and sprinkle with the parsley. Looks lovely, and I may try your advice and make it with anchovies, even though I typically find them too strong. Just wondering, are you using fresh pappardelle? It looks fantastic in the photo! I’m not a big anchovy fan but you are right that they don’t dominate the flavors in this sauce. Yum! Looks delicious! I’ve never made it but always used to love the version my mom made. This looks really good – seriously! Heather M. – Darn! I googled and everything! Had no idea anchovies were in this dish. Interesting touch! This looks delicious, I love pasta with a little heat. I also make daily visits to the grocery store. I literally try not to make the same thing twice in a month….lol. Keep it up! 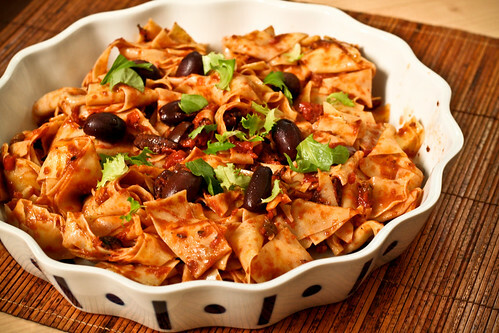 I love this dish, but haven’t tried it with pappardelle (I never remember how to spell these pastas) and it just looks so much better :) or maybe that’s just your elite photography skills!